Today we are once again making the backgrounds that we created in the last two days into cards. I have made several more backgrounds that have not yet been made into cards, and perhaps they never will. I can say however, that I have learned several things from this class. One thing I have learned for sure, that I am not the only person in the world who goes through many steps and spends many hours producing one little card that may or may not get sent…….ever. With this card I made a DIY diffuser. Now I cheated a bit as I was a bit too lazy to glue numerous copies of a die cut together to make a diffuser shape. I chose to use a Tim Holtz Bigs Die and grungeboard. That way only two layers of the diecut needed to be glued together to provide the thickness needed to use it as a diffuser. I used an embossing folder called Bohemian Botanicals and used bright bold colours to further the Bohemian look. 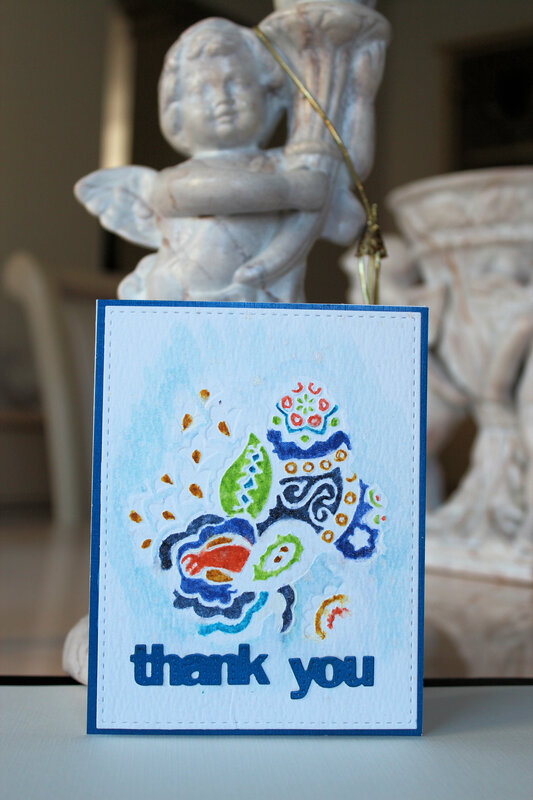 I sprayed (over-sprayed truth be told)the finished card face with Imagine Crafts Shimmer Spritz. While the intense sparkle WAS the look I was going for, the aforementioned over-spray caused the watercolour to run which was NOT a look I wanted. Overall, it is not a bad looking card. I think using a diffuser was useful in this case. If the whole card front had been embossed and painted this boldly, it might have been too much. Posted on August 1, 2015, in Deb's (Oscar's) class samples, Oscar's (Deb's) Card Samples, Uncategorized and tagged Online Card class. Bookmark the permalink. 1 Comment.